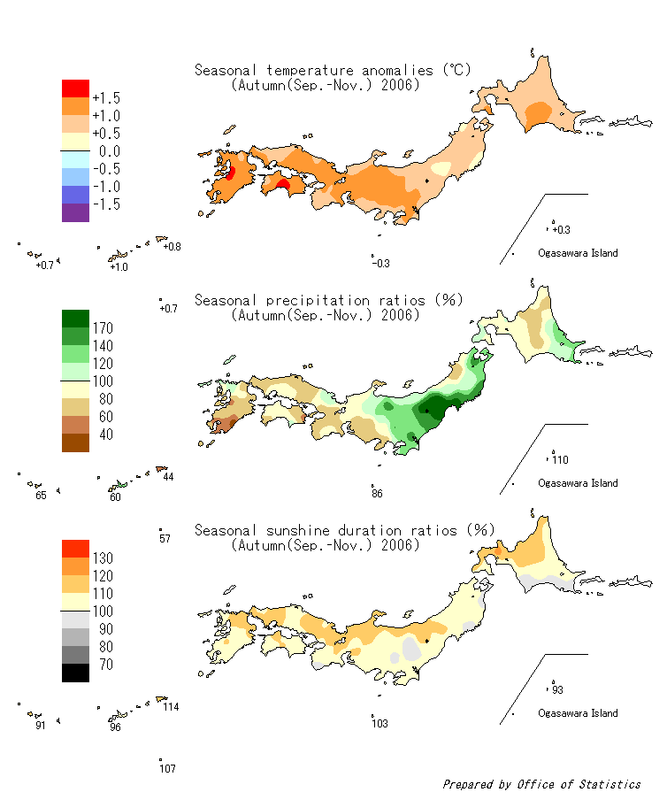 Autumn mean temperatures were above normal in whole Japan. In September, temperature varied with a period of several days. During October and November there were hardly any cold spells and temperature anomaly continued to be above normal, reaching its peak in late October. In the northern part of Japan, it was extremely warm in November. (Figure 1). Though it had plenty of rainfall due to the tropical cyclone (T0613 SHANSHAN) in the middle of September, fine and dry weather continued from late September to early November in the western part of Japan and in Nansei Islands. Especially in the Amami and Daito districts, where dry condition continued since July, they suffered damage from severe water shortage. The tropical cyclone (T0613 SHANSHAN) hit Japan in the middle of September and the developed low passed along Japan in the early October caused heavy rain in some places. This tropical cyclone generated tornadoes in Nobeoka city, eastern part of Kyushu. And intense tornadoes were generated in Saroma town, Okhotsk Sea side of Hokkaido, too, due to the active cold front passed over Hokkaido in early November. Both of them caused serious damage. Nine tropical cyclones occurred in the western North Pacific and three of them came near Japan during autumn 2006. Both were a little smaller than normal (normals are 11.5 and 4.6, respectively). One tropical cyclone (T0613 SHANSHAN) passed across the Nansei Islands and landed on the northern part of Kyushu. It caused serious damage due to stormy wind, heavy rain and tornadoes in the western part of Japan and in Nansei Islands.